Construction workers at Sofco Erectors install steel frame work for the Shark Bridge. NEWPORT, Ky. — With just 21 days until it opens to the public, Shark Bridge construction at Newport Aquarium is feverishly progressing. 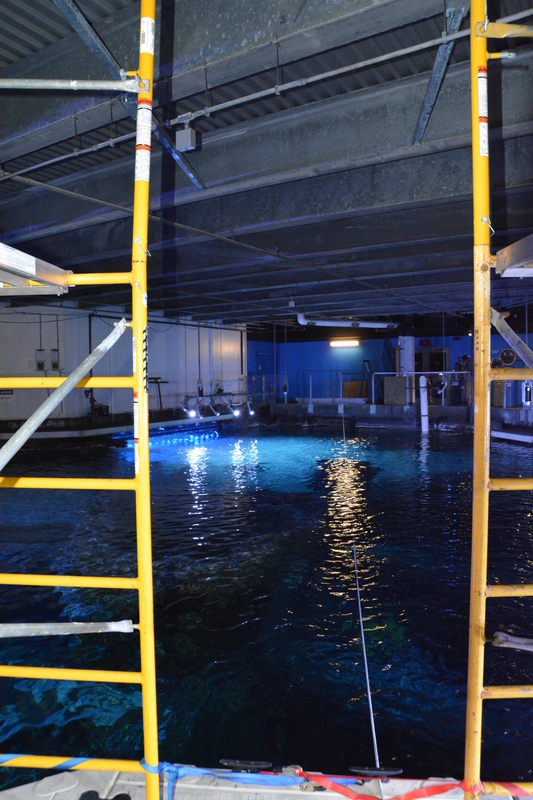 Newport Aquarium’s newest attraction, Shark Bridge is a 75-foot-long suspension rope bridge where you can walk inches above nearly two dozen sharks in the 385,000-gallon Surrounded by Sharks tank. The floor is finished. The floating dock is in the water. What is the next step toward completion of the Shark Bride? 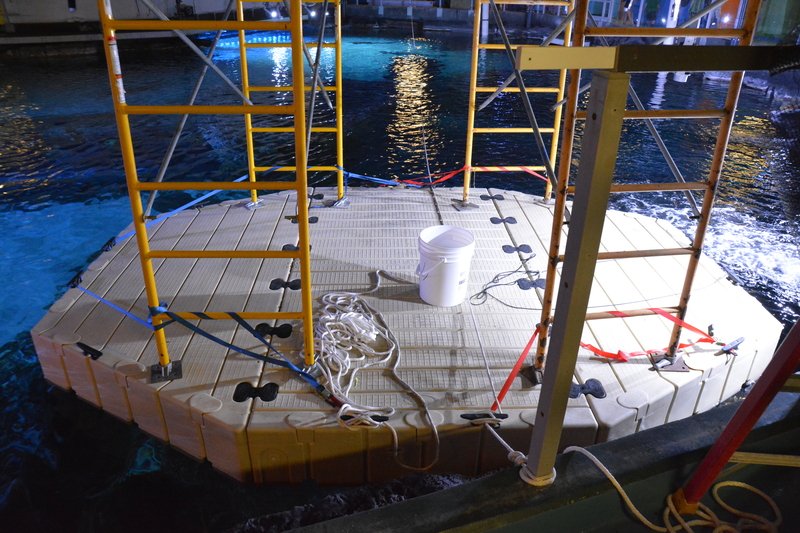 The floating dock currently in the Surrounded by Sharks exhibit. Just as it takes nerves of steel to cross the Shark Bridge; it also takes frames of steel to construct such a bridge. The steel frame for the Shark Bridge was halfway installed onto the ceiling on April 8. 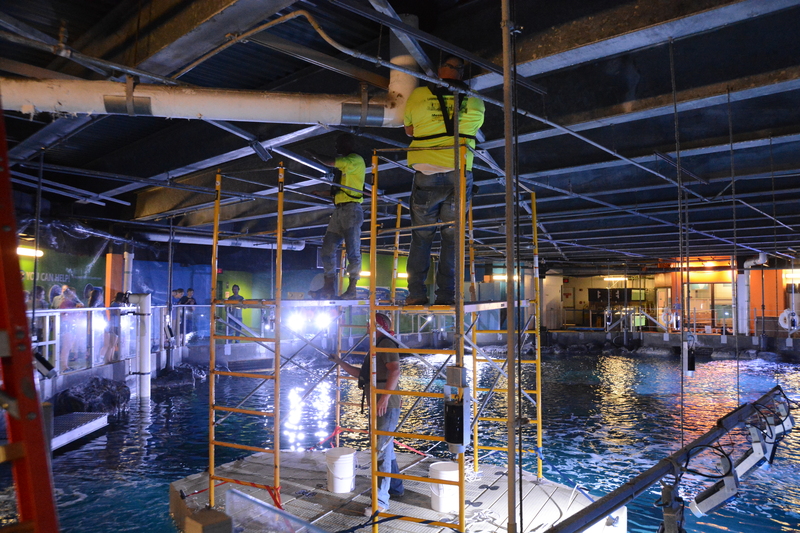 On April 8-9, Cincinnati-based Sofco Erectors installed a steel frame onto the ceiling that will suspend the roped bridge above the shark tank. Sofco Erectors’ list of past steel work projects includes Paul Brown Stadium, the Duke Energy Convention Center and the Aronoff Center. The next step of Shark Bridge construction will be the hanging of the rope bridge, which is expected to begin tomorrow. Shark Bridge opens to the public on April 30. Will you dare to cross? This entry was posted in Shark Bridge, Uncategorized and tagged construction, newport aquarium, Shark Bridge, sharks, steel by NewportAquarium. Bookmark the permalink.